Everyone stops for a moment as the ranger looks over at me suspiciously. Tension whittles away at us for a split second, then the entire car seems to utter a sigh of relief as he resumes the conversation. 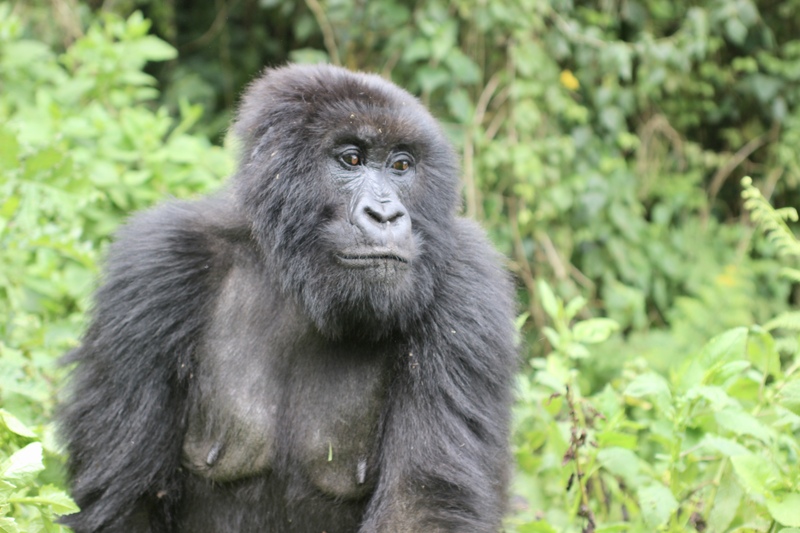 I am going to trek with silverback gorillas today. This is an amazing opportunity, as there are only eight-hundred of these gorillas left in the wild, and only eight people allowed to visit them on a daily basis. Visits are only one hour, otherwise the gorillas risk contamination from human pathogens, thus providing reason for the ranger to be wary of my rapidly developing sniffle. Once we leave the car, the rangers take us through some misty farmland to the base of the mountains the gorillas inhabit. We creep through a low stone wall, then find ourselves in the midst of a green world. Vines tumble off of trees that fill the sky, leaving only patches of blue to whisper over the canopy of the jungle. The ground is muddy as I shove the end of my walking stick into it, half pulling myself up the trail. Soon the forest floor turns into a bed of thick nettles, green stems weaving over one another like snakes. I can’t see the dirt below. The rangers hack away with machetes up ahead, sometimes reaching back to help me and my seven companions over the tangled knot of green stems. Blue envelops us once again as we step into a sea of ferns, rustling gently in the wind. We rest, and then we are on our way once again, crawling through a tunnel of intertwining branches and vines. I lose my balance in patch of mud, clinging to my walking stick and my dignity. The shrill, monotonous, drilling call of some kind of insect amplifies, making my ears ring as I silently wonder how long we have been climbing, and how much of the trek is left. It is beautiful here, but hard and slippery nevertheless. My mood changes when we descend into a bamboo forest. Mist covers the earth, languid and lush through the skeletal stalks. Every now and then, a purple orchid appears in the green carpet of moss and grass and dirt. It is still, like some sort of ghost-land. I silently wonder what the sunrise must look like here, in this sanctuary of quiet mist. It is on our last vertical push over an ocean of coiled nettles that something catches the corner of my eye. The small black shape darts over the treetops just by my head, disappearing in a bundle of leaves and branches. A baby gorilla. And then we come across the silverback. He sits just twenty feet in front of us, staring with warm obsidian eyes. I stop, trembling. He must be about six feet tall, and at least four times my size. His thick black coat covers hundreds of pounds of muscle, yet there is a quiet intelligence in his eyes, some sort of understanding of the world that is strangely human-like. The baby plays in front of him, spinning and twirling on the jungle floor. An adolescent male joins him, and together they showcase a brotherly relationship; the baby playfully climbs onto his older sibling only to be mercilessly swatted down into the bushes. We laugh as silently as possible. After lingering for about half an hour, watching the baby at play and rotating spots on the nearly vertical slope, the alpha male stands. The forest becomes hushed as he slowly towers above us, extending upwards with rippling muscle. His knuckles grinding into the leaves and roots below, he makes his way towards us. “Get down, get down,” the ranger says through his teeth. We all kneel, eyes to the ground – a sign of submission. The gorilla treads past us, stopping for a while near to me. I can hear him breathing as I struggle to comprehend how close I am to this creature, this other form of immense life. He disappears into the jungle. We follow at a safe distance, turning a corner to find the baby gorilla with his mother. She looks at us with amber eyes, ethereal as she sits in an aura of blindingly green leaves, her child in her arms. I stop, struck by the image of this mother and child, by the looks in their eyes. So close to humanity. After a while, she stands, radiant. I look at her and I see a timelessness, a lifetime of green leaves on the mountainside, of rain, of a child following in her footsteps. In this brief moment of time, I see myself, and my ancestors, and those before them. I see something, whatever it is, that is shared between us. Baby in her wake, she melts away into the green shadows of the sun-touched jungle. I stare after her and this age she embodies, this innocence of before. I leave the mountain a different person.